Travelling through Colby heading towards Castletown on the A7 continue into Ballabeg and follow the sharp bend to the right, Friary Park is the next turning on the left. On turning into Friary Park bear right at the junction and take the first turning on the right hand side. No 129 is on the right hand side of the cul-de-sac clearly identified by our Black Grace Cowley for sale board. Loft access, coved ceiling, built in cupboard for coats, built in airing cupboard housing a water cylinder with shelving for storage. Large spacious lounge with double aspect. Tiled fire surround with tiled hearth with open fire, televison point, sliding uPVC patio doors leading out to a raised patio area. Views towards Port St Mary and countryside. Coved Ceiling, plenty of power points, views over front garden. White 4 piece suite comprising paneled bath with mixer bar shower over, wash hand basin set in vanity unit, over light mirror. Fully tiled walls, shaver socket. Electric up and over door, window, Upvc side door leading to rear garden. Shelving for storage, light and power sockets. Mature shrubs to front of garden. Paved rear garden with a couple of trees and shrubs for low maintenance, raised patio area. Oil tank to side of property. Large driveway suitable for approximately 3 cars. All mains services are installed. Oil fired central heating. 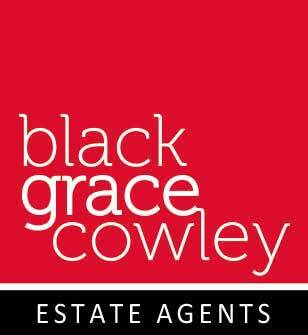 Viewings strictly through the agent Black Grace Cowley.